Have you ever wanted to do something to a dish, but aren’t sure quite what or are tired of the same thing? Balsamic vinegar can be the perfect remedy. Its sweet and sour flavoring works well in salad dressings, sauces, and marinades; on steaks, seafood, and pasta; and complements fresh fruit and desserts. Balsamic vinegar adds a nice twist to sweet and sour sauce. Despite the fact that people have been savoring its flavors since the Middle Ages, this versatile vinegar didn't become known or popular in North America until the late 1970s. Perhaps Italy didn't want to share with the rest of the world, but now the secret's out of the pantry. Traditional balsamic vinegar, balsamico tradizionale, is a glossy deep brown and has complex flavors of sweet, sour, and the woods in which it was stored. It is made only by Modena and Reggio Emilia, from Italy's provinces in which it originated 900 years ago. Because of the lengthy and time honored process, a bottle of balsamico tradizionale can cost between $100 and $400. Commercial grade balsamic vinegar is a modern version of the traditional. It is more available and affordable because it can be mass produced rather quickly, unlike the traditional, which requires at least 12 years. Condiment grade is often a combination of the first two types of balsamic vinegar and is usually labeled as condimento balsamico, salsa balsamica, or di mosto cotto. 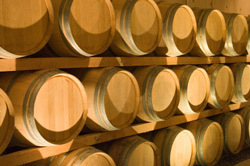 The production of traditional balsamic vinegar, down to the bottles and caps used, is governed by law through the consortia in Modena and Reggio Emilia. Authentic balsamic vinegar is identifiable by the Aceto Balsamico Tradizionale di Modena or di Reggio Emilia on its label. Although Modena and Reggio Emilia produce them, their commercial and condiment grade balsamic vinegars do not have consortium approval because they contain wine vinegar, aren't aged, and are made without consortium supervision. Likewise, whether produced using the traditional method or not, balsamic vinegar made outside of those provinces also lacks the consortium's seal of approval. Traditional balsamic vinegar is made from a reduction of trebbiano grapes. The white grapes' juices are boiled down 30% and then fermented and aged to concentrate the flavors. The vinegar is aged for a minimum of 12 years in seven barrels of successively smaller sizes in different woods: chestnut, acacia, cherry, oak, mulberry, ash, and juniper. Much like for Scotch or wine, each wood provides its own taste to the balsamic vinegar and is the reason for its rich brown color. At the end of the ageing period (12, 18, or 25 years) a small portion is drawn from the smallest cask and each cask is then topped up with the contents of the next largest cask. Other balsamic vinegars may be made with varying proportions of grape juice and wine vinegar without aging. Modena’s commercial grade products (aceto balsamico) imitate the traditional product of the distant past. Made from white wine vinegar, coloring, flavorings, caramel and at times thickeners like guar gum are added. Condiment grade balsamic vinegar can be made in the traditional way, but there aren’t any official standards to ensure quality. Whichever grade, whether made in Modena, Reggio Emilia, or somewhere else, a little bit of Italy’s sweet not-so-secret secret can go a long way in adding flavor.